I know most people think of two days that stand out in February. 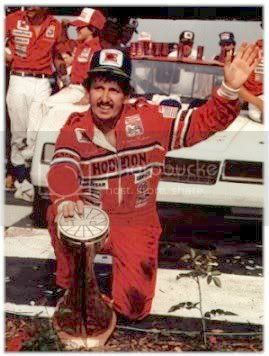 One of which would be Valentine's Day and the other is the day NASCAR lost the infamous Dale Earnhardt, Sr.
Today also marks another tragic day in NASCAR—the day we lost Neil Bonnett in a practice crash. It has been 15 years since that day, and as we embark on the anniversary we remember Bonnett. Bonnett was born on July 30, 1945 in Bessemer, AL. He was brought into NASCAR by protege Bobby Allison and quickly joined the Alabama Gang. Later, Bonnett became teammates at Junior Johnson Racing with Darrell Waltrip and finished as high as third in the Winston Cup points. During his lifetime, Bonnett appeared in movies such as Burt Reynod's Stocker Ace and Tom Cruises' Days of Thunder. In April, 1990 Bonnett suffered life-threatening injuries at Darlington Speedway. While in recovery from the injuries he couldn't stay away from the track, so he became a commentator for TNN, CBS, and TBS. Then, in 1992 Bonnett returned to the track as a test driver for good friends and hunting buddies Dale Earnhardt and Richard Childress. Three years after his horrendous wreck at Darlington, Bonnett returned to the track to pilot the No. 31 Mom & Pops Chevy for RCR at Talladega Super Speedway—Bonnett's home track. His return wasn't one to remember after he flipped his car in a fiery crash. After the wreck, he returned to the booth for CBS Sports to call the remainder of the race. Later in 1993, Bonnett returned to the No. 31 car for the final race to help out friend Earnhardt, who was in a points battle with Rusty Wallace for the Cup championship. Bonnett qualified the car in case Earnhardt's legendary No. 3 had problem on race day, he would be able to switch seats. The No. 31 car was ironically set up with Earnhardt's seat and set up just like his No. 3. Three laps into the race, Bonnett parked the car with a blown engine to guarantee another spot for Earnhardt. Earnhardt went on to win the championship that year. In 1994, Bonnett was declared to be fully recovered and rejuvenated. He signed to drive for James Finch in the Cup Series and on Feb. 11, everything would end with a terrible turn four wreck—claiming his life. In 1998, Bonnett was inducted into the Motosports Hall of Fame, the same year his buddy Earnhardt won the Daytona 500—an event that eluded him for 19 years. During Bonett's 18 year career he compiled 18 wins, 156 top-10 finishes and 20 poles in 362 starts. Today is the 15th anniversary of the day NASCAR lost a pioneer and I pay my respects to this wonderful man.